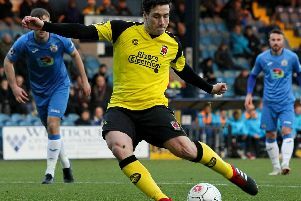 Chorley skipper Andy Teague paid tribute to departing boss Matt Jansen ahead of a new era under Jamie Vermiglio. It has been a weekend of change at Victory Park after Jansen’s shock resignation on the eve of Chorley’s pre-season. Jansen spent eight years at Victory Park going from player to coach and then manager three years ago when Garry Flitcroft left the club. But now the 40-year-old, who guided the Magpies to the National League North play-offs twice, has stepped down, citing the relationship between himself, the owners of the club and CEO Dave Riche which he says has ‘irretrievably broken down’. Skipper Teague, 32, says it was a shock to all of the players: “Nobody expected it. “We found out on Friday morning and pre-season started on Saturday, so for it to come out of the blue like that it was a bit of a shock. “He did a good job and all the lads looked up to him. Teague was player of the season, and the former Lancaster City man thanked the boss: “The season prior wasn’t my best season and he still had faith in me, put his trust in me and hopefully I paid him back with my performances.